[image deleted]Thanks for taking the time to reply, but you missed the point of the meme. First things, first. The video was staged and the body was not that of a dead person's. 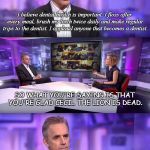 Secondly, this meme is about the SJW interviewer constantly (and deliberately) misconstruing Jordan Peterson's points/argument. The full video is 30min (HERE: https://www.youtube.com/watch?v=aMcjxSThD54 ) and well worth the watch for any SJW/feminist or anyone wanting to see an SJW with a perceived moral high ground, get buried intellectually. It's a prime example that facts don't care about your feelings.It's why SJWs don't want to talk/debate. They can't appeal to emotions when faced with reality. Well done. I wish I had thought of that one. Congrats on being the first to use my template. You can literally type 'first' and be justified in doing so..